The image of delicate chocolate, intricate lace and baby ducklings are associated by many people to a commercialized view of Easter, but in the quaint, medieval town of Bruges in Belgium, this scene represents everyday life during spring and summer. With canals lacing the city, Bruges holds many attractions and endless photo opportunities for the diverse interests of its visitors. And you can believe everyone when they say Belgian chocolate is a whole new experience. Shops filled with chocolate truffles or lace tablerunners line almost every street. Walking past a chocolate boutique and not stopping in is next to impossible with the aroma of delicate pralines beckoning every visitor to come inside. The lace shops feature mostly machine-made lace, but handmade, smaller pieces can be purchased as well. A selection of colorful tapestries in the form of pillowcases and handbags are also available in these stores. Canal and horse-drawn carriage rides are an alternative to walking the city. Some of the carriages offer tour guides to highlight the major sights while guests relax and enjoy the scenery. Climbing towers or cathedrals can become an obsessive habit in Europe. The Belfort on Market Square is one of those towers. With 866 narrow steps leading up to the bell tower, visitors are rewarded with a phenomenal view over the city. At 11 a.m., the tower plays its music, and those who can bear the sound can watch the hammers clanging the bells. One of the sweetest views in Bruges that visitors in the spring and summer can enjoy are the little ducklings that follow their parents along the canals. The Minnewater, or the Lake of Love, is the home of the city’s ducks and swans and is located alongside the peaceful Begijnhof. Bruges is designed for walking, biking or running, but not driving. Around each new corner, guests can explore unique buildings or beautiful, serene landscapes. The Burg, the second of the two town squares, is lined with picturesque façades. Each building represents architecture from a different historical period, such as traditional medieval, neo- Gothic, Romanesque, Renaissance and Flemish Baroque. The Church of the Holy Blood sits along this square. Every year on Ascension Day, which is 40 days after Easter, Bruges holds the “Heilig Bloedprocessie.” A phial containing drops of Christ’s blood, the relic of the church, is paraded through the town streets in the Holy Procession. This 800-year-old tradition involves many town members dressing in medieval and biblical costumes and is one of the city’s most popular events. 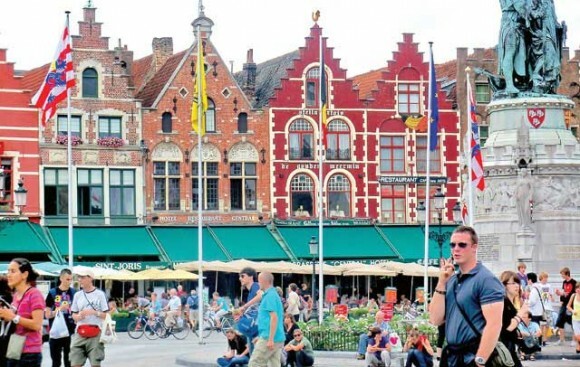 Bruges quietly rests 45 minutes west of Brussels along the Belgian coast, approximately a 4 1/2 hour drive from Ramstein and the Kaiserslautern military community, not much further from Wiesbaden and about 6 hours from Stuttgart. This small town, which began with the building of a castle in swamplands during the 9th century, is now a cherished United Nations Educational, Scientific and Cultural Organization World Heritage site and is visited by numerous tourists throughout the summer. Originally published in the Kaiserslautern American newspaper on June 2, 2017. Click the image for a full-size, printable version.